My current (and much more glamorous than my previous) job has me working events in San Francisco every couple of months, and I have had the privilege to stay overnight on those evenings (as opposed to driving almost 90 miles home to Sacramento post-party). 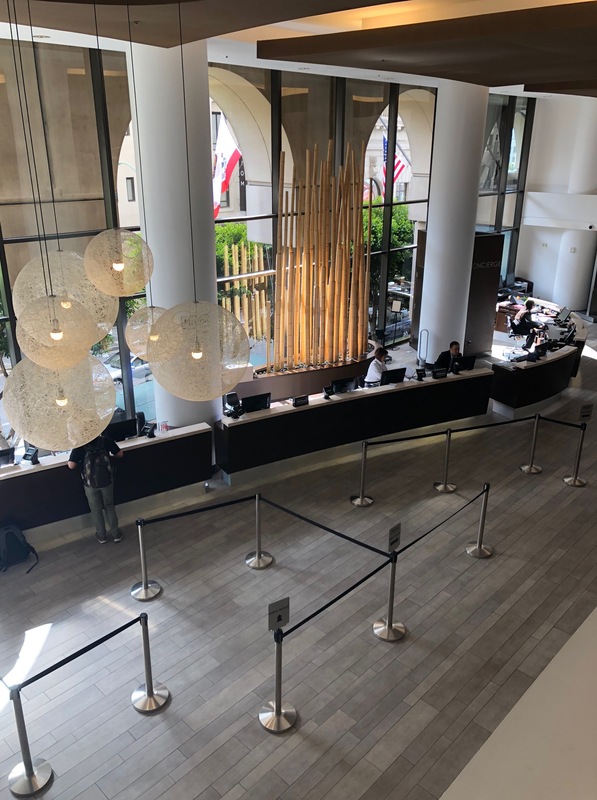 During the first two events, I stayed at the Hilton San Francisco Union Square, and for the last two events (and the subject of this blog post) I stayed at Parc 55, which is right down the street from the Hilton San Francisco Union Square, and also a Hilton property. 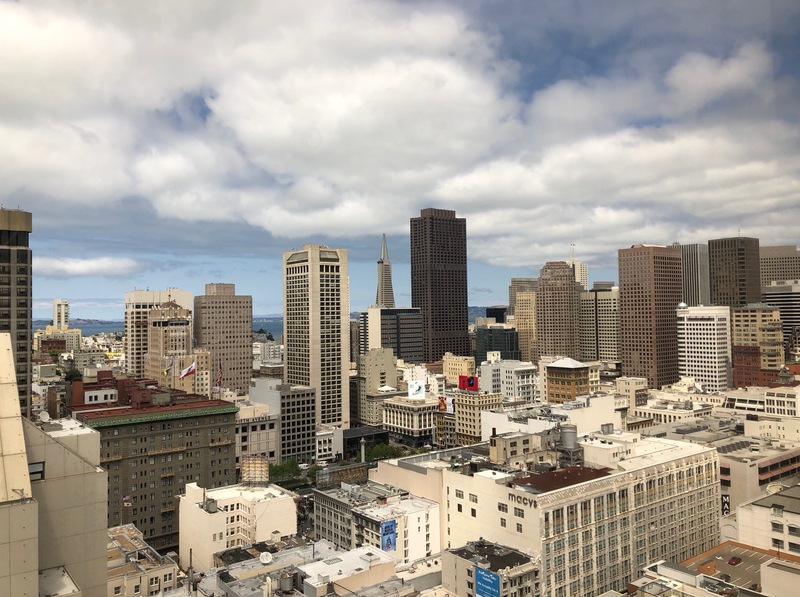 Location is key and serves as quite an amenity at Parc 55, because you can literally see all of San Francisco from some of its 32 floors that offer breathtaking views of the City and the Bay. The hotel is walking distance to Cable Cars, Union Square, and the Moscone Convention Center. There are many restaurants within walking distance of the hotel, or if you prefer to stay at the hotel, there are three onsite dining venues: Cable 55 Restaurant and Lounge, Kin Khao, and Barbary Coast. Here is a photo of my room (which was located on the 32 floor). Just out that window were gorgeous views of iconic buildings and landmarks for which San Francisco is so well known. I could have spent all day staring outside. I don’t know what it is about San Francisco and its tall buildings, but I love looking at them. Here are a few photos I took from two different rooms during my visits. After my work gig, I came back to my room and this lovely bottle of Chardonnay was waiting for me. The hotel also left some chocolate covered strawberries in my room refrigerator, too. Thanks to the Parc 55 marketing team for making my stays so very pleasant. There is no room service at Parc 55, however, it you can satisfy your hunger at one of its aforementioned restaurants. On both evenings, I visited Cable 55 on the lobby/reception level of the hotel. Below is a peek of their menu. Giant thumbs up for offering several gluten-free options! It’s always a good thing when I can’t decide what to order because everything looks so incredible! The evening of my first stay, I decided on Vincent’s Burger (angus beef, thick-cut pepper bacon caramelized beer onions, Fiscalini cheddar) on a gluten-free bun with a green salad* on the side. *I am still on my French Fry moratorium (put into place post-Las Vegas trip because I had so many French Fries there I will never need to eat them again)! I also enjoyed a glass (and a half) of Martin Ray Rosé of Pinot Noir with my burger. The restaurant offers a glass and a half option (this one was $17) for those who want a little more than a glass, but do not wish to buy an entire bottle. I was really tired and hungry from the work event, so this meal was really comforting and one of the better burgers I have had in a restaurant. Vegetarians, fear not, as Cable 55 now offers the Impossible Burger on their menu! On the evening of my second visit to the restaurant, I chose the Cobb Salad (with romaine lettuce, chicken, bacon, hard-boiled egg, heirloom cherry tomatoes, Kalamata olives, avocado, and Point Reyes blue cheese) and paired it with a glass of Mionetto Avangarde Brut. Because I had to get up early the next day and return to the office in Sacramento, I returned to my room for the night. Below is me in the lobby of Parc 55 in one of my favorite dresses! I love dressing up for work events! The next day, I hit gym at Parc 55, 55 Fitness, to workout before returning to Sacramento. 55 Fitness is a nice gym, and bigger than most hotels with several treadmills, bikes, elliptical machines, and also equipped with free weights and a few weight machines. Check out was a breeze at Parc 55. I checked out a few minutes before 11am, and texted a code on my valet card to signal I was ready to leave. My car was ready for me when I arrived outside. This is just another amenity of extreme convenience available to hotel guests. Though my stays were short, it’s always a treat to visit San Francisco and take in the views. I still can’t believe I live so close to such a world-reknowned place. 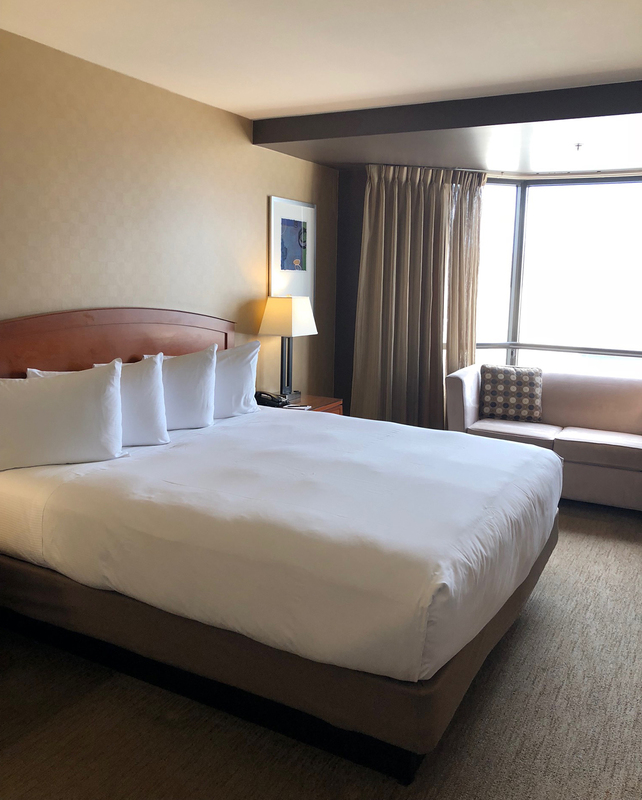 I am looking forward to staying at either Parc 55 or the Hilton San Francisco Union Square on my next visit to San Francisco! Disclosure: I was given a media rate on May 10th and May 15th at Parc 55, my review and my opinions are my own.